This is my GPS. 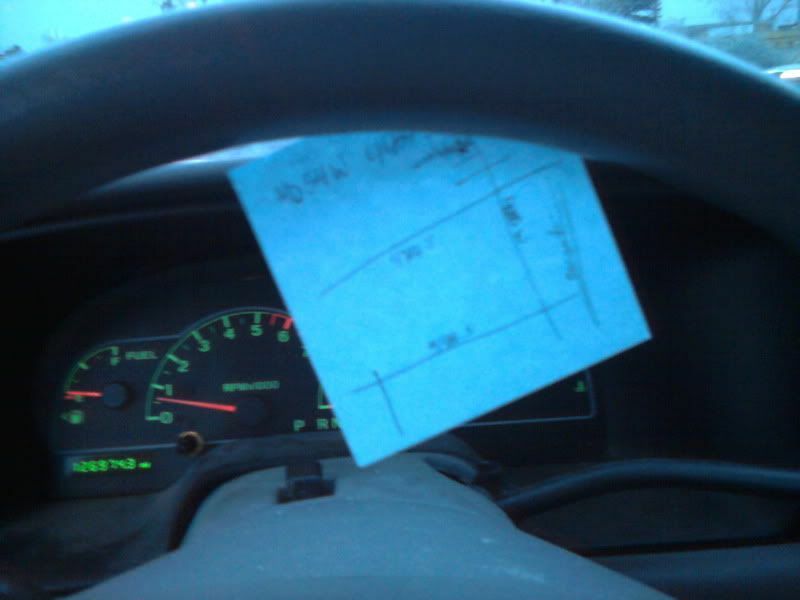 Sticky note with a scribbled map and address. Our van isn't new and cool enough to have stuff like built in DVD players, GPS and power sliding doors (a girl can dream) and I don't see the point in getting portables DVD, GPS, etc when it would probably just distract me. Of course having my sticky note fall off and land under my feet is kind of distracting too so...yeah. I usually don't let the boys cover the table with art stuff because they leave it all over and getting them to clean up the mess is as fun as fenphedrine reviews but some days it's worth it. The boys got some new Crayola color wonder and glow coloring stuff and the actually spent about 2 hours peacefully coloring with it. No TV wasting their brains, no fighting, no messing up the playroom. 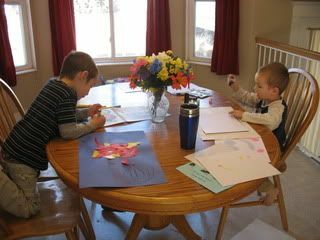 Just cute little boys sitting nicely and coloring. It's amazing how quickly I forget how uncomfortable and miserable I was just 6 weeks ago. I know I could barely move, was exhausted from lack of sleep, complained about my adult acne, and my back and pelvis ached constantly, but it's hard to really remember how bad I felt when I feel so much better now. Crazy how time seemed to go so slowly when I felt awful but is going by so fast now that I've been feeling so happy and healthy. 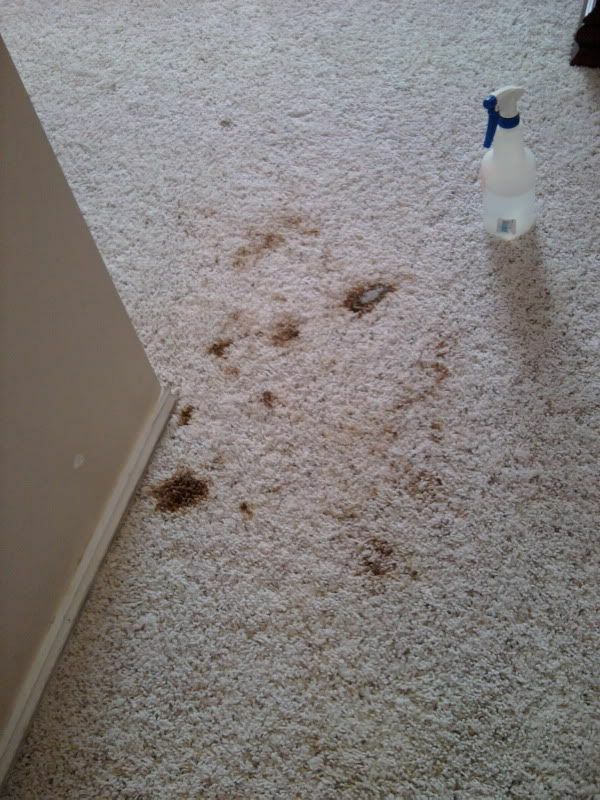 I'm a member of a few twin parenting messageboards and there are frequently the same questions asked over and over. Some of the most common are advice on which stroller to get, how to get twins to sleep well, and if their belly will ever get back to normal after a twin pregnancy. Luckily for me I was given a double stroller so I didn't bother asking which kind to get, my twins naturally sleep pretty well, and my belly is looking surprisingly well. I think I just have good skin. I only have a handful of stretchmarks above my c-section scars and they aren't even noticeable. I never used any special creams or lotions for reducing stretchmarks, though I thought about it. I still have a few inches I want to lose around my belly, but I should be able to take care of that with exercise. I need to get out my Slim in 6 DVDs and start exercising with those until the weather warms up and I can get out to run. A few weeks ago we decided to cut off our cable tv service. We only watched a few of the hundreds of channels plus our cable provider was raising their rates by almost double what we had been paying. So no more cable tv for us. We still get digital broadcast tv though. We decided to get Netflix and so far we love it. There are tons of tv shows and movies that we can watch anytime on the computer or streamed through our Wii. Plus we get 1 DVD at a time so we've been getting movies that we didn't get a chance to see in theaters. The best part though is no commercials! It's weird not to hear about new tv shows, the most popular diet pills, and fast food restaurants. Now we can just watch a whole show uninterrupted. The boys really love it and have learned how to connect on our Wii and find the kid shows. We just watched Iron Man 2 and right now we are watching Scooby Doo before bed. 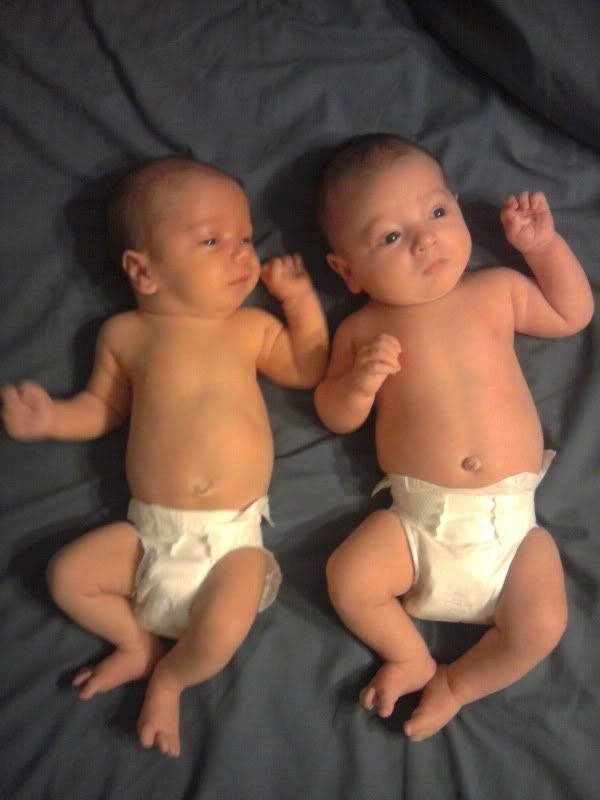 Having two babies is as good as having the top 10 diet pills I swear lol. Not only am I burning about ton of calories a day nursing, but I also have little 8-9lb weights I get to carry around all day. I should be pretty buff in a few months haha. Not really, but it really is a pretty good workout having these two little cuties to take care of all day. It's been really nice not having to worry about school this semester. Last semester was very stressful and I'm not really looking forward to going back this fall. Pretty soon I need to start filling out scholarship applications, hopefully I can get another tuition waiver this year. And now that we have taxes filed I need to fill out the FAFSA again and look up classes for registration in a few months. I really don't like school, but I figure it's important to have a degree in something I could actually use to support my family if necessary. I definitely don't have the work experience to get a good job lol. Most of my jobs have been fast food and call centers, no sales jobs or specialized work or anything that could even come close to providing the income needed to support us. So, even though I still plan on being a stay-at-home mom I need to update my skills in case I need a job at some point. On Sunday my babies were 1 month old! I can't believe how quickly time is going by. 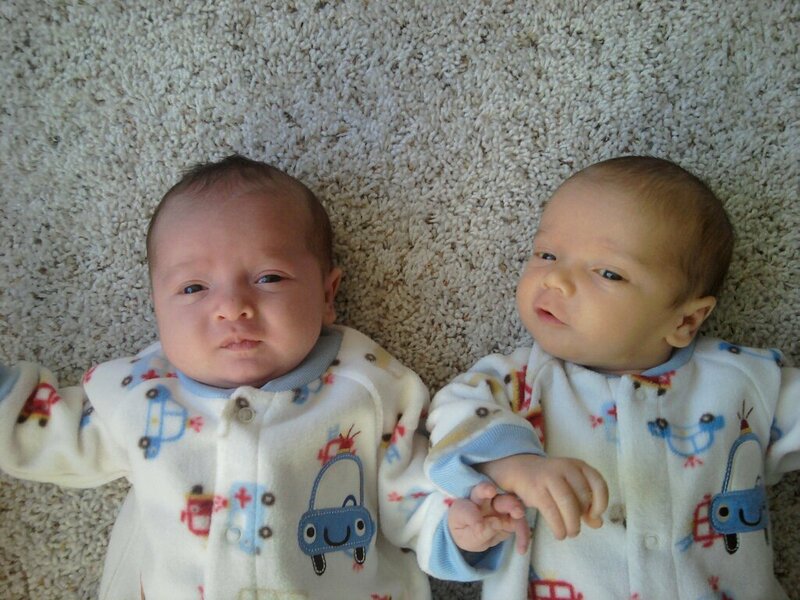 They are such precious little boys and I want time to slow down so I can enjoy this cute baby stage more. Overall I've found being a mom to twins so much easier than I'd expected. I'm sure a lot of that has to do with the fact that they normally sleep pretty well. I don't do well with little sleep so when they sleep good things are much easier. They had some rough nights in the last few weeks because we've been dealing with thrush, Isaac latching wrong, and my milk supply being a little low. But things are getting better. The thrush is clearing up and Isaac has been latching correctly again, so I don't want to scream every time we nurse. Also I started drinking more water and eating oatmeal and my milk supply seems so have gotten better. I have been giving Isaac a 2oz bottle most evenings to help out since he's such a piggy, but hopefully my milk supply will fully catch up and I won't need to much longer. I love seeing how different they are already. Isaac is definitely more demanding and vocal. He loves attention. 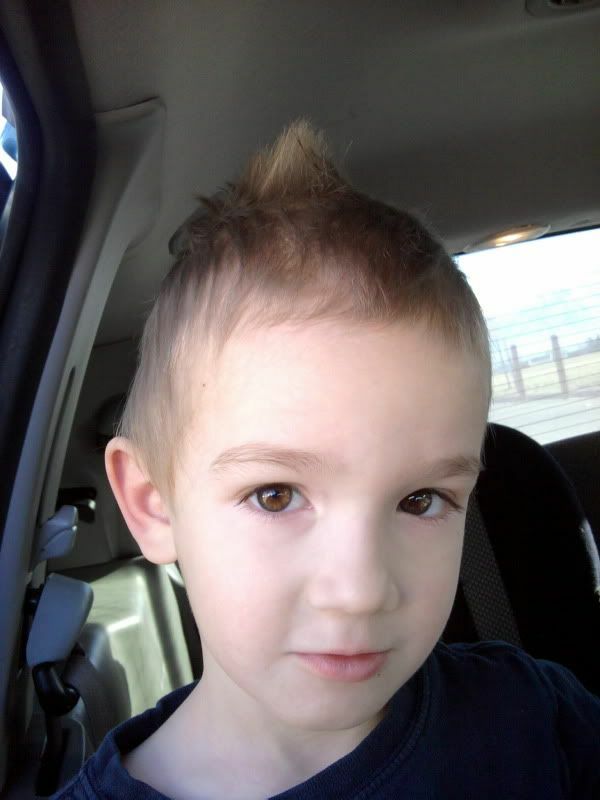 Caleb is calmer and easy-going. Both love to be cuddled and talked to. They have started being awake a little more during the day which means they want more of my time, but they still sleep quite a bit too. 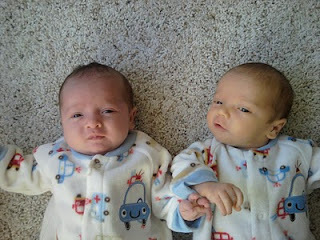 I am so blessed to have these two little boys, and their 3 adorable older brothers who love them to pieces. I just have to say a little brag on my babies. 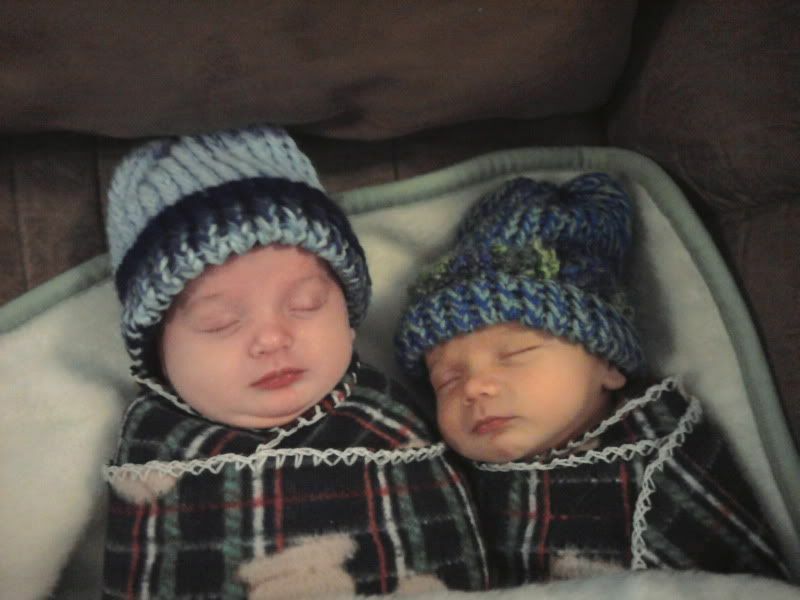 :D Of all my kids so far, the twins have been the best sleepers. They do have occasional nights that are harder, but most nights they are great. I am definitely getting more sleep now than I was while pregnant with them. I don't even need an orthopedic mattress (though it would be nice) and I'm sleeping so good. They usually only wake up once a night. They are normally down for the night by 11pm, then wake up around 3-4am, and then up for the day around 7-8am. Last night they didn't even wake up until 5:15am! Plus of course they still nap most of the day. It has been such a blessing that they sleep well, I don't handle sleep deprivation very well. I'm just hoping they keep it up. They turned out so great! Now we just need to get some frames for the prints we ordered so we can get them hung up. It's been so long since we actually printed out any pictures. I think the last time was 2 years ago, Hubby printed a bunch out to frame for a Christmas gift to me. So it's way past time to put up new ones. I haven't even updated the SD card in our digital frame in that long. I'd love to have a photo printer again. Of course then I'd need to look up where to buy discount office supplies to get ink and photo paper. It might just be cheaper to have them printed somewhere, but it would be more convenient to do it at home.